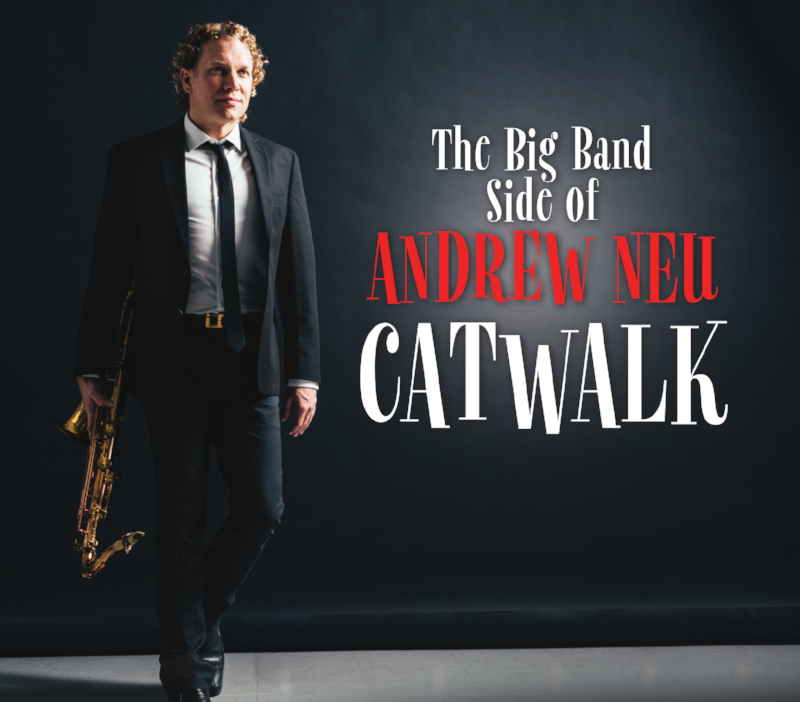 CATWALK is Andrew Neu's debut big band CD and was recorded in 2016 at the legendary Eastwest Studios in Los Angeles. This well-rehearsed band of seasoned studio musicians was co-led with trumpeter, Tony Bonsera. The playlist includes eight original compositions as well as the standards Body and Soul, Cinema Paradiso and What Is This Thing Called Love all arranged by Andrew. Wayne Bergeron, Rick Braun, Randy Brecker, Brian Bromberg, Gordon Goodwin, Eric Marienthal & Bob Mintzer. By blending a unique mix of jazz, R&B, classical and Latin music, saxophonist Andrew Neu delivers a fresh sound to the contemporary music scene. Whether he's in concert as a solo artist or a sideman, Neu's musicianship and engaging stage presence continue to get the attention of audiences and critics alike. Andrew's 4th CD is embellished by a horn section and a full orchestra, takes you on a journey around the world. Andrew co-wrote a song with Bobby Caldwell and arranged a unique take on the jazz classic, Take Five. Inspired by the soul jazz and Latin music of the 1960s, It's reminiscent of Quincy Jones and Sergio Mendes. Steve Oliver, Jeff Lorber, Bobby Caldwell, Rick Braun, Ramon Stagnaro & Brian Bromberg. Andrew's sax playing on his third CD, TRY SOMETHING NEU, is stronger than ever and shows off his real jazz chops. For this release, he brings together the dream team of producers, Brian Bromberg, Chuck Loeb and Gerald Veasley. Each presents their own style of music; you hear a little LA, NYC and Philly vibe. With the ever present Bright and Tight Horns as well as the brilliant vocals of Bobby Caldwell, Andrew's debut on NuGroove Records immediately hit the top 20 on the smooth jazz charts. Chuck Loeb, Brian Bromberg, Dan Seigel & Bobby Caldwell. Some artists and their material achieve such a comfort level from the very beginning, and that comfort level is conveyed to listeners so early on, that the fact it attracts many of the peers in that particular genre is almost inevitable. Such is the case with saxophonist/composer Andrew Neu and his latest release, Try Something Neu, a delightful musical adventure indeed. Featuring a rousing selection of guest musicians including Chuck Loeb on guitar, Brian Bromberg on bass, Demetrios Pappas on piano and organ, Brian Culbertson on trombone, and Bobby Caldwell on lead vocals in a fan favorite of Caldwell’s “Next Time I Fall (In Love)”, Neu assembles an unit with the penetrative potency of an invigorating elixir. As outlined in previous SaxShed.com reviews, Andrew Neu has been gradually and steadily building a name for himself since the early 90s. I have witnessed his growth and maturity as both a person and musician over the past two decades. He has truly hit his stride with the very polished release Try Something Neu. Working with a cast of musicians whom he refers to as “the best in the business,” Neu beams with pride over his offering from NuGroove Records, his first on the prestigious label. Starportrait review of "Try Something Neu"
It's easy to applaud to Andrew Neu's album Try Something Neu. Appealing songs combined with professional horn arrangements and Andrew's solid flabbergasting solo performance makes this album a winner. Although Neu hits another home run with the sunshine filled and brass enriched title track, truth to tell the entire collection is of an exceptionally high standard. Not only that, for a player who previously has tantalized with a blend of jazz, R&B, classical and Latin, ‘Try Something Neu’ gives him an identity on which he looks sure to capitalize. Andrew's second CD, IN CLEAR VIEW, began production in Philadelphia in 2004 with producer, Tom Petroski. A fortunate introduction to bassist/producer, Brian Bromberg, resulted in his contribution of 4 tunes with LA musicians. Fusion masters, Jeff Lorber, Dave Weckl and Vinnie Coliauta along with the Bright and Tight Horns bring tremendous energy as well. The first single; Wine, became Andrew's first radio hit and helped to propel him towards an alliance with Bobby Caldwell. A true smooth jazz project, this album continues the use of live musicians in making this a classic record with a lot of deep tracks. Andrew Neu, longtime smooth jazz favorite in Philadelphia has released his newest Cd entitled In Clear View. His latest independent release boasts the addition of Jeff Lorber, Brian Bromberg, Dave Weckl, Vinnie Colaiuta, Doc Gibbs, Kevin Toney and Gerald Veasley. With such fine additions to the sound of this talented saxophonist, this Cd is bound to make some noise. On Café Jazz, we're continually on the prowl for sounds that are exciting and fresh - so here now is a great young player whose music not only fills the bill quite nicely, but whose name also perfectly encapsulates that sentiment of newness. Andrew's first CD, INSPIRE, was released in 2000 and brought together some of the best musicians of the Philadelphia/Atlantic City area. This album put him on the national scene and several tracks have remained mainstays on smooth jazz radio to this day. Pooling all of his talent and experience, this eclectic and adventurous project is highlighted by strong compositions. This album was the debut of the Bright and Tight Horns which became a signature of his sound. Andrew's insistence on using real instruments ensured that INSPIRE will stand the test of time. Recorded, Mixed and Mastered by Thomas M. Petroski and Glenn Barratt at Morning Star Studios, Springhouse, PA. This solid, easy-to-listen-to, and high-spirited instrumental saxophone CD was released by the artist himself; the fact that it's nearly as good as any sax album put out in 2001 by a major label is proof that smooth jazz sax is a crowded field.